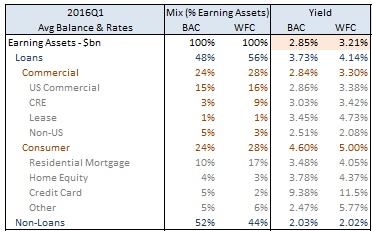 Had BAC generated the same 3.2% yield on earning assets as WFC in 2016Q1, rather than the (FAS91-adjusted) result of 2.85%, it would have added ~20bps to firm-wide, after-tax ROA representing more than half the gap between the reported, adjusted ROA of ~70bps and management’s intermediate target of 1%. Securities Portfolio: Approximately 20% of the earning asset yield-gap arises because WFC takes more credit risk than BAC in its securities portfolio, representing ~20% of earning assets for both banks, to generate a yield of over 3.0% versus 2.4% at BAC. The yield-gap is particularly pronounced in the available-for-sale securities portfolio, representing ~three-quarters of the total securities portfolio for both banks, where WFC has an allocation to credit instruments, such as municipal, corporate, and asset-backed securities but excluding agency mortgage-backed securities, of ~40% compared with ~15% at BAC (see Chart A). Earning Asset Mix: Approximately 40% of the earning asset yield-gap arises because BAC has fewer loans in its earnings-asset mix than WFC; the specific proportions are 48% at BAC and 56% at WFC. This, in turn, is a consequence of the run-off of the legacy loan portfolios, and particularly the legacy mortgage loan portfolio, at BAC which declined 30% y/y in 2016Q1 generating a 13% decline in the overall residential mortgage loan portfolio and hence, given this portfolio is 20% of total loans, an ~3% headwind to loan growth. With the legacy mortgage portfolio now just over half of the total mortgage book (vs. 70% in the year-ago quarter) and the non-legacy “relationship” mortgage portfolio growing at 30%, we expect the overall mortgage portfolio to generate no meaningful headwind in 2017 and an accelerating tailwind thereafter. Loan Yield Differentials: Another ~40% of the earning asset yield gap arises because BAC generates a lower yield on its loan book than WFC: 3.7% versus 4.1%. This is not so much because of mix issues, with both portfolios split equally between consumer and commercial and despite WFC’s higher proportion of first mortgages in its consumer portfolio (60% vs. 40% at BAC) but because sector-by-sector WFC generates a higher yield (see Chart B). In some cases, this is a result of relative credit risk aversion by BAC; for example, the auto-loan book at WFC, accounting for 60% of the “other” consumer portfolio, has 27% of balances to borrowers with FICO scores of less than 680 while the figure for BAC’s “other” consumer portfolio is <10%. In other cases, such as residential mortgage, home equity, and US credit card, the FICO profiles of the portfolios (excluding BAC’s legacy book) are similar so that the excess yield at WFC may represent a measure of durable distribution advantage. The different arcs followed by the balance sheets of the big-3 US depositary institutions – BAC, WFC, and JPM – will drive yield differentials and, specifically, lead to a narrowing of the 40-50bps gap of WFC over BAC and JPM (Chart 1). WFC, for example, is growing its trading book at near 30% while the equivalent balances at JPM and BAC are flat to down, and JPM reduced its short-term investment book, including cash-on-deposits with banks, by over 15% while the equivalent balances at BAC and WFC are flat to up. This note compares the earning-asset trends at the three banks in support of our view that the yield-gap will narrow and driving our preference for BAC and, to a lesser extent, JPM over WFC. Source: Company Reports, SSR Estimates (yellow-shaded). JPM does not report in SEC filings the average balances and yields for all consumer and commercial loan segments separately; the consumer segment loan balances, therefore, are end-of-period. Yield and Interest Income on BAC Securities portfolio is FAS91 adjusted. JPM generates a higher-yield than WFC on its loan and trading books, the same yield on its securities book, and yet a meaningfully lower-yield on overall earning assets (2.7% in 2016Q1 versus 3.2% at WFC). A key reason is that JPM is relatively overweight in short-term investments that yield only 55bps and represent ~one-third of earning assets which is double the proportion at WFC, but the tilt is leveling. Over the year to 2016Q1, for example, JPM reduced average deposits with banks with banks by ~25% to $364bn from $480bn as the end-of-period balance for high-quality liquid assets (HQLA) fell to $505bn from $614bn. The bank remained compliant with the liquidity coverage ratio (LCR) requirement that HQLA represent at least 90% (rising to a “fully-phased” 100% on January 1, 2017) of estimated cash outflows over 30-days following an “acute stress event” because of a decision to reduce non-operating deposit balances which are deemed by regulators to be vulnerable to flight under stress and hence contribute meaningfully to the denominator in an LCR test. JPM’s balance-sheet is also converging towards that of WFC as the bank increasingly invests excess deposits in residential mortgage loans rather than mortgage-backed and other securities, so that the securities portfolio declined 15% y/y in 2016Q1 while the residential mortgage book increased over 30% contributing to a broader mix-shift from non-loan assets, with average balances down nearly 15% y/y 2016Q1, to loan assets with average balances up ~10%. There is further runway for this mix-shift given whole mortgage loans are nearly half of combined mortgage and securities balances at WFC versus just over 40% at JPM. A signal feature of BAC’s evolving balance-sheet is run-off from its legacy portfolios, particularly mortgage but also to a lesser extent card, which generated meaningful negative growth in the consumer loan portfolio. For example, the legacy residential mortgage loan portfolio, held on the balance sheet of the “all other” segment and comprising those loans originated prior to January 1st, 2011 that would not have been originated under the underwriting standards established by BAC on December 31st, 2010, represents over half of the consolidated residential mortgage portfolio and for 2016Q1 contributed to a y/y decline in mortgage loan-balances in the “all other” segment of 11% (Chart 2). The residential mortgage portfolio in the “all other” segment is not exclusively legacy since until 2014 some newly-originated mortgages were also debited to this book. However, beginning in 2014, BAC began to retain certain residential mortgage loans in the consumer banking and asset management (i.e. GWIM”) segments consistent with where the overall customer relationship is managed. As shown in Chart 2, this relationship-based mortgage loan-book is growing at the same 30%+ rate as that at JPM albeit of a significantly lower base. As a matter of arithmetic the continuation of these growth rates for the legacy and relationship-based mortgage loan portfolios would mean that the mortgage book in aggregate will not represent a meaningful drag on overall loan growth in 2017 and will provide a meaningful and accelerating lift to overall loan growth in 2018 (Chart 3); there is plenty of runway since, even extending these growth rates out to 2020, BAC’s mortgage loan portfolio would be smaller than the $275bn of WFC’s owned mortgage book today (Chart 3).